Because Castlewood Canyon State Park is hidden in the plains–and not the mountains–near Denver, it’s often an overlooked State park of Colorado. But, whether you’re hiking or rock climbing it’s a beautiful and geologically unusual place to explore. 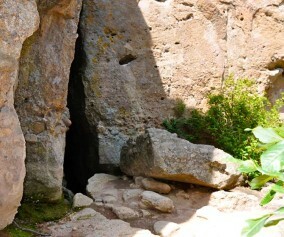 It boasts a waterfall, homestead ruins, a stream, caves and clefts, and a lot of fairly easy hikes. Below you’ll find more information on how to get to the park, trail map links, and links to several hiking options in Castlewood Canyon. Not just a canyon, this Colorado State Park features ruins, a waterfall, and unusual geological formations. The park is riddled with 15 trails, ranging from 1/4 mile to 4 miles, so you have a lot of options. The Canyon View Nature Trail (1.2 miles) is a great example of a handicap accessible trail in Colorado. The East Parking (see map below) offers the most hiking options, while the West Parking area leads to shorter hikes to the Castlewood Canyon climbing areas and the longest (4 mile) East Canyon Trail. 1. 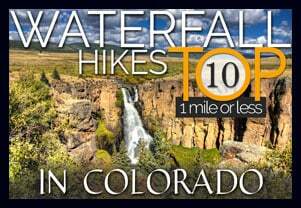 Waterfall Hike at Castlewood Canyon State Park – This may be the most accessible waterfall near Denver. A short .17 mile hike from the trailhead. Click on the red link above to go to the waterfall hike trail profile page. 2. 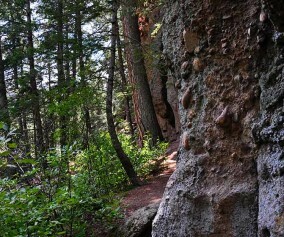 Cliff & Climbers Trail at Castlewood Canyon State Park – A short but more demanding hike in Castlewood Canyon where you can explore the crags along the cliffs of the park. 3. 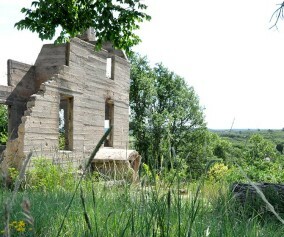 Homestead Trail at Castlewood Canyon State Park – an easy to medium hike at the west park entrance. Check out the hiking profile to see how to turn this .7 mile trail into a 2 or 4 mile loop hike. 4. Cave Trail at Castlewood Canyon State Park – only a quarter mile round trip up to a small cave in the west side of Castlewood Canyon State park. 5. 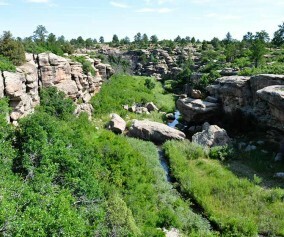 Canyon View Nature Trail at Castlewood Canyon State Park – 2.4 mile round trip hike with interpretive signs that takes you along the rim of Castlewood Canyon. One of the best handicap accessible trails near Denver. TIP: Castlewood Canyon offers some shade, but you are often in the sun. So, bring your sunscreen and apply it liberally. TIP: We would also suggest an early morning or sunset hike as these are the best times to observe wildlife. 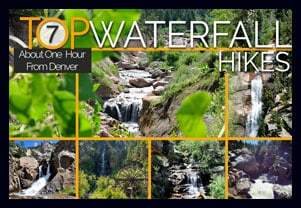 TIP: Though it’s not the largest of Colorado waterfalls, you’ll still hear it before you see it. The waterfall is accessed from Creek Bottom Trail on the West Side of the park. TIP: Pets are allowed on a leash but there are some specific trail restrictions, so make sure to read the signs. 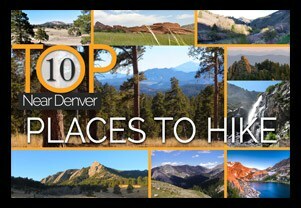 Enjoy this wonderful hike in the grasslands of Douglas County, Colorado. 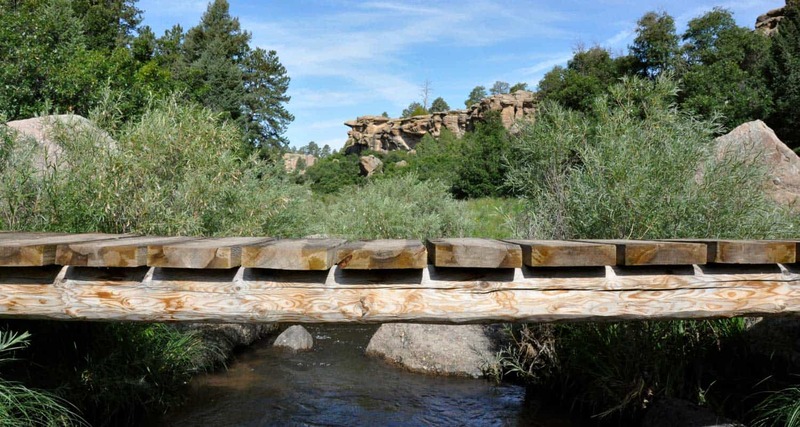 Are there bike trails at Castlewood canyon? What is the cost? Is there a military discount if there is a cost? Local residents discouraged hiking there during warm months due to frequent rattlesnake encounters. Vet clinics in area see snakebites to clients’ dogs from this park. Will look further for any note of dangerous wildlife of which to be aware. Strange experience in this park every time i have tried to hike here. In the daytime it is beautiful but at night seems to be another story… 2 years ago me and a group of friends went on a hike about an hour before sunset in october(smart right?) and it was relatively nice except for one of my friends who looked almost scared saying they felt uneasy. It was getting dark so we returned to the car to find the keys locked in the car…. we ended up breaking the window for lack of a spare and just as it got too dark to see, left the park. Fastfoward to 2018 and i ended up taking another trip out with 2 different friends but this time i was driving. Instantly when we pulled back back into the parking lot in the exact place we had parked before i felt uneasy and i got involved in my friends bickering but we got out of the car and went for a hike anyway. 40 mins into the hike it turned dark so we decided to head back to the car and what was sitting on the seats? The keys. AGAiN. While calling for a ride everyone began arguing and around that time it when it got scary. All 3 of us can account for having heard a type of growling and movement in the border of the trees. Whether you believe in ghosts or not…. the history of this place brings with it a type of energy i had never felt anywhere before this place. Very little is to be said about experiences here besides testimonies from the staff in the park office and gift shop who have witnessed strange things as well. This place is honestly kind of terrifying.